DIVING IS ALL ABOUT SEEING and exploring the underwater world. Most people experience this unique setting only by viewing it on a screen, but as divers, the mask serves as our portal to a first-person experience of the aquatic realm. The scuba mask is typically constructed of a flexible material, such as silicone, and designed to fit the face, including the eyes and nose. The mask is designed with a skirt that seals the mask to the face to keep water out and provide an air space so the eyes can focus underwater. It has a tempered glass lens (or lenses) for viewing. One drawback of the mask is its tendency to fog. 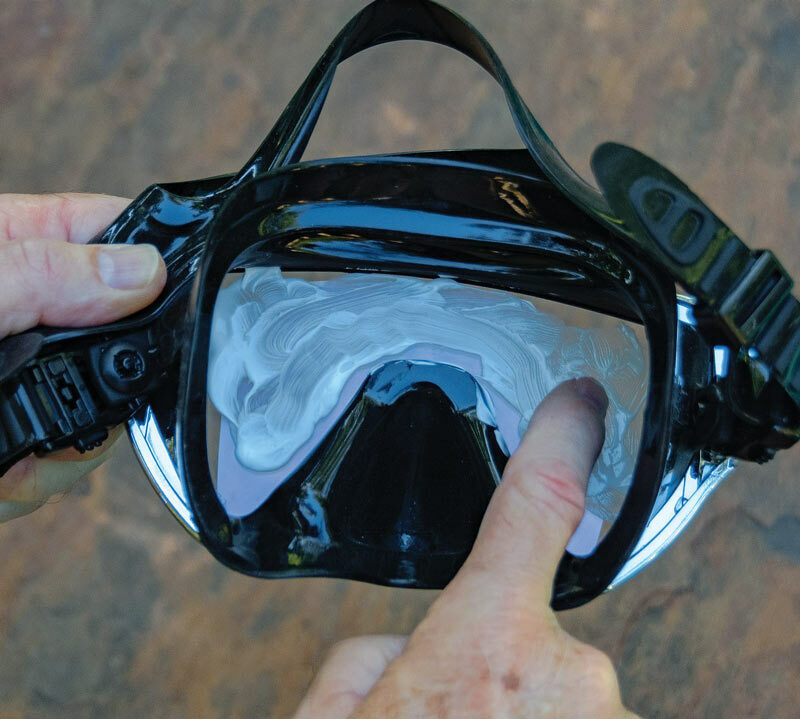 In this article we’ll examine how to select, prepare and care for the scuba mask, including how to keep it fog-free and clear it easily while diving. When it comes to securing your very own window to the underwater world, the best place to shop for a good quality, well-fitting mask is your local dive center. There are subtle nuances to selecting the ideal mask and the pros at your dive center are trained to assist. The staff will explain how to test for a proper fit, how to adjust the strap and why being able to access the nose pocket with your thumb and forefinger is important. They’ll likely have a wide selection of masks from which to choose and, in some instances, they may have samples you can test in a pool. Low-profile masks provide a wider field of view and make skills like mask clearing and equalizing a bit easier to perform. Some standard masks give a wider field of view due to clear side windows, which increase peripheral vision. Other options include masks with clear silicone skirts creating an open feeling. Dark colored skirts are also popular, especially with underwater photographers, because they tend to shade the eyes and reduce ambient light. Mask frames and skirts come in a wide variety of shapes and colors, such as white, blue, yellow and purple. For eyeglass wearers, some masks can be quickly and easily outfitted with corrective lenses that match your prescription. Some new mask styles offer special features like lenses with underwater color correction and UVA/UVB (ultraviolet A and B) filtering to protect your eyes from harsh sunlight. Before using a new mask for the first time, follow the manufacturer’s instructions for pre-use cleaning. Photo by Barry and Ruth Guimbellot. Once you’ve selected a new mask, read the manufacturer’s instructions for pre-use cleaning. Some masks have lenses that are treated with a special anti-fog coating and don’t require any special cleansing prior to first use. In fact, aggressive cleaning techniques on treated masks can damage the defog treatment. Mask lenses that aren’t treated with a special defog coating should be scrubbed with a very mild abrasive cleanser and rinsed well before use. Commercial mask cleaners introduced in the past few years are very efficient. However, there are some home remedies that also work well. One of the best cleansers is non-whitening, non-gel toothpaste. Before applying toothpaste to the lenses, wash your hands to remove any oil from your skin as natural body oils and cosmetic oils such as sunscreen lotions will negate the effects of the defogger. Now spread the toothpaste over the entire lens and skirt (inside the mask) with your finger or a soft-bristled brush. Rub thoroughly, then rinse well. Some people swear by using fire instead of water to prepare the mask for its initial use, suggesting that you remove the coating by burning it off — heating the inside surface of the lens with a lighter. We do not recommend this technique, as you could easily warp or melt the mask’s silicone skirt and you risk injuring yourself in the process. To help prevent fogging, apply a defog solution. Next, rinse with a small amount of water. Photo by Barry & Ruth Guimbellot. Masks tend to fog when moisture forms inside and condenses on the lens. As we mentioned previously, mask fogging can be a common problem, but it’s one that has several simple solutions. Defogging solutions work as surfactants that coat the lens prevent fog from forming. 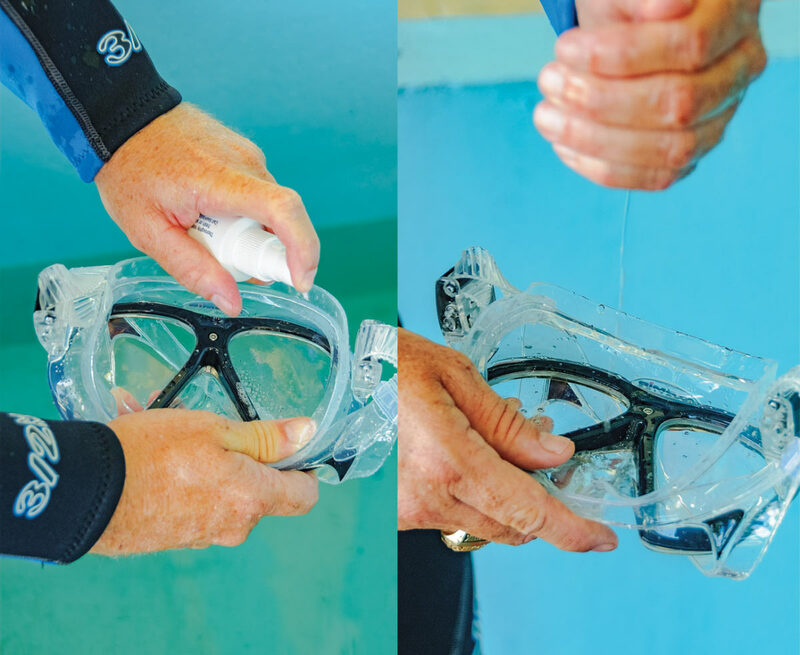 Although you have completed the initial pre-use cleansing of your mask, you will likely need to use a defogging solution prior to each dive, although recently, defogging solutions have been introduced that are reported to last for an entire day of diving. Numerous commercial products are available in spray bottles, as gels, drops or paste. Some products are rubbed on the lenses and left to dry. Prior to the dive, the lenses are buffed until clean. Ways to defog your mask are definitely improving, making a lot of divers very happy. Of course, there are always the old standbys, which included diluted baby shampoo and saliva. Check again to be sure the mask is a good fit. An improperly fitting mask can contribute to fogging. The more your mask leaks, the more it will fog due to rinsing off the defog solution in the mask. To help prevent this problem, reduce the amount of water allowed in the mask. When donning the mask, feel around the mask skirt to be sure no hair is trapped under the skirt as this can allow water to leak into the mask. Exhaling through your nose can contribute to fogging. It takes practice and time to learn how to consistently breathe through the regulator, not through your nose. Remember to avoid touching your mask after applying the defogger, as the oil from your skin negates the effectiveness of the defog product. Avoid placing your defogged mask on your forehead or in direct sunlight. After each dive trip, rinse your mask in warm, soapy water to remove any sunscreen residue. Allow the mask to dry before storing it in its original case. Avoid placing your defogged mask on your forehead or leaving it in direct sunlight. Photo by Barry & Ruth Guimbellot. There are times when your best pre-dive defogging techniques just don’t cut it and you might find yourself struggling to see clearly through a partly cloudy mask. In this case, try washing the fog away. Do this by intentionally breaking the mask seal and letting a small amount of water inside. Tilt your head down and move it from side to side, swishing the water over the lens to wash it clear. Next, simply perform the mask clearing skill the way you learned to do it in your Open Water Diver certification course. Your scuba mask is indeed your window to the undersea world. Caring for it properly will help keep the mask fog-free so you can see clearly and enjoy your diving adventures. If you’ve been certified for a while and you’re still using the mask you purchased when you first learned to dive, you owe it to yourself to visit your local dive center and see the latest selection of dive masks now available. Recent advances in technology have given manufacturers the ability to design masks that are lighter, fit better and offer a wider angle of view than the ones available even a few years ago.